Head for the Hills will perform at Pickin’ on the Poudre at the Mishawaka Amphitheatre to kick off the outdoor concert series on Saturday May 17, 2014. Voted “Best in Bluegrass” by Denver Westword magazine, Head for the Hills needs no introduction in Colorado. Though rooted in bluegrass, the Colorado-based quartet aspires musically well beyond the boundary of the genre’s tradition - just listen to “Never Does” from their latest album Blue Ruin for a dose of their sound. In fact, sample these tracks and you’ll be rocking to them: “Solar Bowling Shoes”, “Blue Ruin”, “Nooks and Crannies”, and “Unchain My Heart”. Their vocal and instrumental harmony is complete bliss. 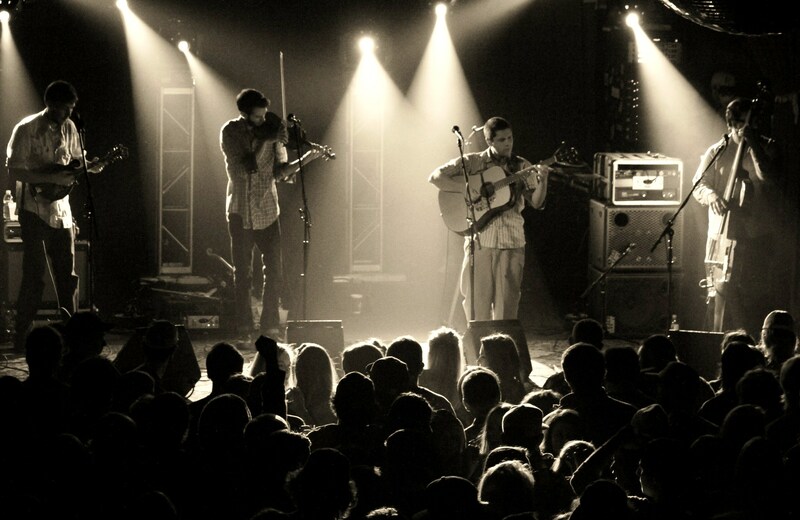 It is no wonder for their presence at the Telluride Bluegrass Festival and their acclaim at the South by Southwest Music Conference and Festival (SxSW). 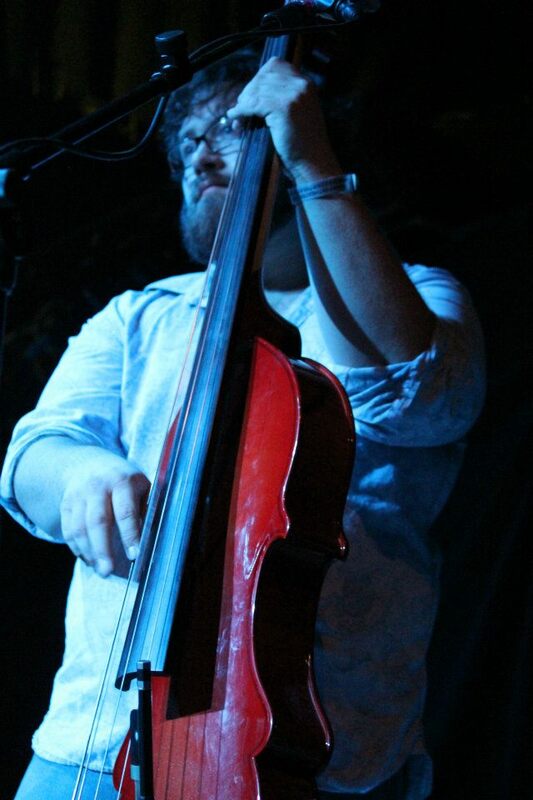 Before they kick off the Mishawaka Summer Series for the 10th year now, Grateful Web talks to Head for the Hills bassist, Matt Loewen. GW: I’m Vinh Nguyen with Grateful Web joined by Matt Loewen of Head for the Hills. How are you doing today Matt? Matt: I am doing well. Thank you, thanks for having me on. GW: Great. I think we were here with you guys back in 2012 -- with Joe. We’re glad to have you guys back. Head for the Hills has a tremendous following especially here in Colorado. From the perspective of new fans coming to hear you for the first time, how would you describe Head for the Hills music? Matt: Sure. We start with bluegrass. That’s kind of the basis of the band but we really expand way beyond that and bring in strains of music like jazz, rock, modern stuff, more folky stuff, a couple of country kind of tunes, classic kind of stuff. So, we really start with bluegrass and go from there. There’s no real electronic element. There’s electric mandolin sometimes and very rarely is there a drum kit – there is no drums in the band. Other than that, we really involve a lot of different types of music, a lot of different sounds, and things like that, and that’s The Hills sound. GW: On your website, you mentioned “Newgrass”. How would you describe newgrass? Matt: Well, I think it ends up being a catch all term, which is fine, for everything within the bluegrass quote unquote…happened after the first and second waive of artists. I guess the way I would think of newgrass is essentially the music of Sam Bush, Bela Fleck, David Grisman, etc - the music that they kind of ran with. They took the sound of Bill Monroe and some other people that came directly after him and kind of morphed it into this thing that we and other artists, like us, are kind of continuing and still bringing in things that are current, etc. GW: I noticed some of your influences [from Facebook “Artists We Also Like”: John Hartford, David Grisman, Bill Monroe, Pink Floyd, The Infamous Stringdusters, etc]. Matt: Yeah, definitely within the bluegrass thing. None of us grew up in what you think of as bluegrass quote unquote houses or anything like that. We weren’t going to jams as three years old or anything. So, we came to the music through the people that I mentioned – the newgrass guys and through newer artists too. Of course the deeper you go, you go back and get into all those other guys too. But, they were some of the first ones that we were really inspired by and continue to be inspired by all those folks. And everybody like I said that came after, Chris Healy and all those guys too. GW: Your latest album is Blue Ruin. Tell us about that album. Matt: You know, we released that last year. It’s our third studio record. We did a live album so it’s our fourth release. It’s called Blue Ruin. The way we kind of thought about it and the way it turned out it’s really like the best expression of what Head for the Hills is all about in terms of synthesizing these different elements and blending them in with bluegrass music instrumentation. The record involves a number of different styles of music within the bluegrass thing. There’s definitely a kind of a more rock-oriented tune on there. There’s country stuff. There’s jazzy stuff. It’s wide-ranging in that but still…Head for the Hills thing. We recorded it outside of Fort Collins here at Swingfingers Studios. We got Andy Hall from “The Stringdusters” playing on it. We got Gabe Mervine from The Motet playing on a track. We got our frequent collaborator Mr. James Thomas playing some Rhodes Electric Piano on some songs. Placed a couple of other people on there. It’s something we’re really proud of. We got it available additionally, obviously, on CD. We also got a 180 gram vinyl release of that. GW: Listening to that the other night, it’s great! I’ll point out one track that attracted me, “Priscilla the Chinchilla”. Is that right, Priscilla the Chinchilla? GW: It’s an instrumental track. What a great track that would be to hear live! Tell us about that one and where you got the name? Matt: Sure, that’s the one we got Andy Hall playing dobro. Where the name from was just one of those – Mike the mandolin player wrote the tune – that we haven’t really come up with a name. We frequently have trouble naming songs. In fact, I don’t know anyone who doesn’t have trouble naming songs – I like to meet that person. Anyway, we were just kind of driving as any touring musician does. You spend really most of your time travelling in a van or bus, whatever it is – definitely a van for us. We were just brainstorming and chewing the fat, if you will, just throwing things back and forth in the front seat of the van. I think that came up as kind of a silly idea that kind of fit the tone of the song. There’s definitely a history or trend in this style of music where you name the instrumental songs something maybe a little tongue-in-cheek. It’s kind of an opportunity to be playful and funny. GW: I just love saying “Priscilla the Chinchilla”. GW: What’s the band creative process? Matt: It varies. I would say the primary songwriters -- we all write as well -- Adam and Joe end up writing more. We all write individually but we do it collectively as well. I say a general overview of half of those creative process is people coming up with ideas on their own and then bringing them to the group – anywhere from being a very small, not developed idea to something that’s almost completely done. Anywhere within the range, bring it to the group. Sometimes, we just learn the song that the person had written and sometimes we arrange it as a group. Sometimes, we come up with something, if there is something that maybe missing or it’s not quite done yet, we’ll come up with a bridge. Or, do whatever to finish the song -- so, a little bit of everything. I know that Adam and Joe – Joe in particular – will write while he’s driving. He’ll being doing weird…while he’s driving. I don’t know how he does that. I couldn’t do that. But, he’s able to do that in his head. Joe has a hip hop group called Whiskey Blanket. That’s a big part his – something he has always done. GW: That’s great. I read you guys are voted in Westword “Best in bluegrass”. I think this is a reader’s poll. Coming from the fans, how does that make you guys feel? Matt: We love it. It’s been great. We’ve been vote into that position several years now by them. I think they’re just probably concluding the voting for this year’s thing. It’s always been honorary -- the fact that people take the time to vote for us. We don’t always consider ourselves…the band starts in bluegrass. That’s true but we’ve never been a traditional quote unquote band at all. We also never have been like the people that are “the” best players of Bill Monroe’s style of bluegrass. Our strong point has never been to do that. The fact that people think that we’re a good enough bluegrass band to be voted as such is always really nice. GW: Does that add pressure? Matt: Not really. I think it’s been two or three years that they’ve done that. At this point, I just keep waiting for them to disqualify us. We’ve won a few times. No pressure thankfully, we just feel grateful that people are paying attention. GW: Where are some of your favorite venues to play? Matt: Got one of them right in the backyard here at The Mishawaka Amphitheater in Poudre Canyon outside of Fort Collins. That’s definitely a favorite for us and is kind of a home for the band. On May 17, we’ll be opening the outside stage for the tenth year in a row out there at the Mishawaka. So, that’s kind of crazy. Makes everybody feels kind of old. We’re really excited about that. Like I said ten years, it’s kind of a cool anniversary and that’s always been kind of a home for the band. So, that’s the one I would say, the Mishawaka Amphitheater. Matt: Oh, it’s great. The stage at Telluride, where they have the Telluride Bluegrass Festival and all the other things musically they do there in the town park – that’s a really amazing place to see and to play as is The Planet Bluegrass Ranch there in Lyons. In Portland, love Mississippi Studios. That’s a really nice room and a cool place to see music. I know some of your Grateful Web people live in Eugene and Wow Hall is great place to play in Eugene. So, those are a few. GW: You have a string of concerts lined up here. The next one is May 17 at The Mishawaka as you mentioned in Colorado. I think you’ll play 3-4 times in Colorado, correct? Matt: Yeah, I haven’t look – I don’t have it in front of me. We got a number of good things in Colorado. The thing at the Mishawaka on May 17, we’re doing the RapidGrass Bluegrass Festival later this summer, which will be really cool. The line up on that is spectacular. It’s just really amazing -- acoustic, for the most part the music there. That’s another one we’re looking forward to. We’ll be hitting the Botanical Gardens I think coming up in July. Yeah, lots of good stuff in Colorado. GW: Yeah, come out to see Head for the Hills. That’s all I have Matt. If you have any last words or anything to add, please do. Matt: Thanks for having me on. I appreciated it. You can find out about Head for the Hills at www.headforthehillsmusic.com - that’s our website. We’re on all other relevant inter-web medias. Come see this summer. We’ll be all around the states. Come check us out. Look forward to seeing you guys. Thanks. GW: Thanks Matt. It was a pleasure. We look forward to seeing you guys out there. Matt: All right, we’ll see you soon. Thanks!